Standing on the bank looking down into the small river, I saw so many trout piled up below me it was looking into the raceway of a fish hatchery. It was hard to believe they were wild fish in the “natural environment” of a designated wilderness river. Except for the fact that I had driven thirty miles up steep U.S. Forest Service gravel roads from the nearest town, and then ridden horseback an additional seventeen miles through rugged mountain terrain to get here. These were not hatchery fish. 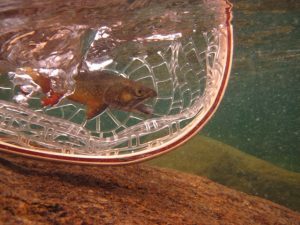 I was in the final week of a nearly month-long visit to Wyoming to do some research and writing, and to create a series of short videos, all about Wyoming’s wild and native cutthroat trip. With me for the month were two Middlebury College student research assistants: Jiayu “Yuki” Hu, a junior Film and Media Studies major working with me on some videos connected to my writing, and Julia Kendrick, a senior history major working as my environmental history research assistant. One of several large North Fork rainbow trout. I landed most of them on a day with Tim Wade, but managed to pull in a coupe others on my own near the Wapiti Campground. We had spent five nights in the Bridger-Teton National Forest researching and filming a project on LaBarge Creek to reintroduce native Colorado River cutthroat trout, and also studying a healthy population of Snake River fine-spotted cutthroat on Greys River. We spent another four nights spread out from Cody to Yellowstone National Park, mostly on the North Fork of the Shoshone River in the northern Shoshone National Forest. There we visited a variety of sites, spending much of a day interviewing a USFS fisheries biologist stationed in Cody, and another day on the river with well-known fishing guide and fly-shop owner Tim Wade. After three nights at the Outdoor Writers Association of America (OWAA) annual meeting in Billings Montana, we returned to Wyoming for our final adventure: a trip outfitted by Allen’s Diamond 4 Ranch into the South Fork of the Little Wind River in the Popo Agie Wilderness—a large southern section of the Shoshone National Forest in the famous Wind River Range. In some ways, I had saved the best for last. I had been wanted to come to the Wind River Range for more than a decade, after first hearing about it from my older brother Ted (who had a couple wonderful family camping trips there), and then from my Vermont fishing friend David Crowne (who takes regular trips out there). Ted lived in Alaska for eight years, in the Smoky Mountains of western North Carolina for several years before that, and on the edge of Colorado’s Rocky Mountains before that. And he still speaks of the Wind River Range as among the most beautiful places he has ever visited, and one of the places he most wants to return to. Indeed, everybody I have ever talked to or heard from who has gone to the Wind River Range has gone back—or wanted to go back. Part of the draw for me was the wilderness fly-fishing—getting away from the crowds and casting flies for wild trout of a variety of species in river and lakes where I could go days without seeing another angler or even another human. But part of the draw was just the wilderness itself, apart from any fishing. Photos and accounts from friends suggested it was one of the most stunningly beautiful places in the country, and far less crowded than many other places of lesser beauty. I say “in some ways” because the environmental history of the Wind River Range (and its trout) is unusual to say the least. It didn’t have the same obvious connection to the subject of my research as the other waters we had visited earlier: LaBarge Creek had an historic population of native Colorado River cutthroat, decimated by the introduction of invasive trout, and is now being restored in a joint effort of Wyoming Game and Fish and the U.S.Forest Service; Greys River, though there had been some stocking decades ago, is now a wild fishery with a thriving population of a different strain of cutthroat: the Snake River fine-spotted, which is part of the Yellowstone cutthroat family; the North Fork of the Shoshone River is a fascinating river to visit and learn about because it still had cutthroat trout, but it also had brook trout and brown trout competing with the cutthroat, rainbow trout not only competing but hybridizing, and (near the bottom of the river where it flows into the Buffalo Bill Cody Reservoir) lake trout preying on cutthroat; and speaking of lake trout, we had also visited (though done no filming at) Yellowstone Lake and Yellowstone River and done some research on the dramatic and devastating impact of invasive lake trout not only on the cutthroat population but indirectly on the entire ecosystem which is based around cutthroat trout as a primary protein source feeding bears, eagles, osprey, mink, otter, pelicans and many other creatures directly, and other creatures indirectly. But that is a topic for another article. Some 10,000 years ago, after the last ice age, when cutthroat trout finally crossed the Continental Divide and started colonizing the Yellowstone River, they eventually made their way up Wyoming’s Big Horn River and into both the Shoshone River and the Wind River and its tributaries. But impassable barriers prevented cutthroat from ever reaching the highest waters of that range, and so European settlers of the west found those lakes barren of fish. During the Great Depression, the now famous Finis Mitchell began stocking the lakes carrying fingerling trout of a variety of different species in by horse or mule and dumping them almost haphazardly into the high lakes in hopes of creating a fishery that would bring business to his guide service. Some of those populations thrived. And a new fishery—or, rather, hundreds of new fisheries—were created. 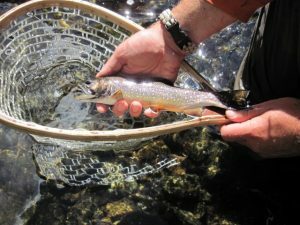 What the South Fork of the Little Wind River and the surrounding lakes offered, then was—though not a pristine native cutthroat population—a beautiful stream where we could see first hand a population of cutthroat trout in competition with the invasive eastern brook trout. And, as it turned out, it also offered the best underwater video opportunities of any river we fished. And some really enjoyable fish. Oh, and beautiful scenery too. Julia, Yuki, and I arrived at the Diamond 4 on a Monday afternoon. My friend Phil Brodersen and his son Rob, were joining us for this final part of our Wyoming adventure. They were there waiting. The hospitable staff of the ranch welcomed us the moment we arrived, showed us our comfortable cabin on a hill overlooking…well.. some of the most beautiful scenery on earth, but I’ve mentioned that already. We spent the evening sorting our gear and then transporting it the stables where the hands loaded it into saddlebags to be ready for a morning departure. We also enjoyed a final night of hot showers, and a luxurious steak dinner at the ranch including peach cobbler and whipped cream for desert. The next morning, after an equally filling breakfast, we hopped on our horses, fitted the stirrups, and were off. The ride in was about seventeen miles, and took us over an 11,600’ pass. Although we didn’t have time to dawdle on the way, our head wrangler Jessie Allen was flexible in giving us time to get out of the saddles when we needed to. Though by the end of the day my legs were sore, it was the sort of trip where every five minutes we would come around another bend in the trail overlooking some new stunning vista, and I would have my camera out again. Or I could have just kept it pointing at the ground as we continued to pass the most amazing collection of alpine wildflowers I have ever experienced. But on to the camping and fishing. 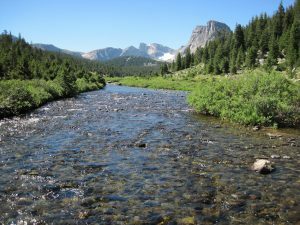 After crossing the high pass, and viewing countless turquoise lakes I knew from my reading held a variety of trout (golden, rainbow, brook, lake, cutthroat), we eventually made it to our destination: a meadow along the South Fork of the Little Wind River. 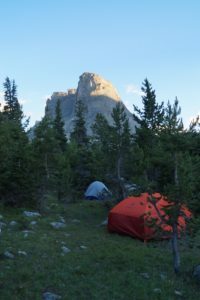 By the time we had unloaded our gear, set up our tents, strung up a rope between trees and hung our food ten feet off the ground (there were black bears in the area), and cooked dinner, everybody was tired and ready for bed. Except me. Passing lake after river after river after lake, I was itching to get out and cast. When everybody else had crawled into their tents, I put together my fly rod, tied on a caddis fly, and walked the thirty yards from our tent down to the river. We had set up our camp at the upstream edge of the meadow where it came out of the trees. Downstream, the Little Wind spread out into a beautiful braided river, often with two or three or even four channels parting and coming together again. Upstream of our campsite it was just a single channel. I found a little path right to the point where the river first split in two, and discovered a small pool about fifteen feet across. I was still in my hiking boots, so I stepped carefully out into a rock three feet from shore where I’d have a little room to maneuver my rod and keep my line from the bushes. And I began to cast into a little channel at the edge of the pool beneath the bushes on the far bank. Though I caught mostly brook trout, or cutthroat with the markings of the Yellowstone strain, I landed perhaps three of these unusual cutthroat: perhaps cut-bows or some strain of Colorado River cuts. Still need to check with a Wyoming G&F biologist. The first cast fell short. The second elicited a swirl and a miss. The third cast landed me a fat 10” cutthroat in the Yellowstone strain. I carefully unhooked and released it in the water. The pool looked big enough for another fish, so I cast again. It took maybe four more casts to land my second fish: a slightly smaller but brilliantly colored brook trout. So here was a river in which brookies and cutthroat were in competition, I thought. I released the brook trout and cast again. 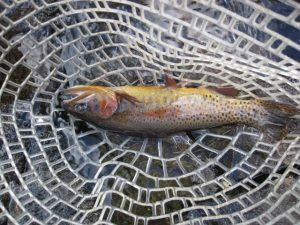 No more than five minutes after I took my first cast on the South Fork of the Little Wind River, I landed my third fish—another cutthroat, but this time of a different strain. It had the parr markings I associate with a Colorado River cutthroat, and a bit of a rainbow stripe. Perhaps a cutbow? [PHOTO TO THE RIGHT] In any case, I had fished five minutes and landed three different species or strains of trout. This was going to be a good trip. Altogether, we had four full days and five nights to enjoy the wilderness and water. 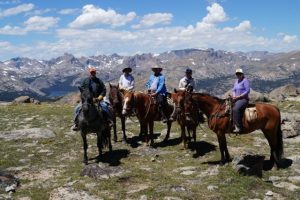 Two of the four members of our company were feeling the effects of the altitude—not just the 11,600’ peak of the pass, but the fact that we were camped at 10,000’. So for the first two days, we stayed pretty close to the campsite and I spent time learning my way around and trying to get a sense of the rhythm of the place. What wildlife was around? When were the major insect hatches? When did the trout feed and what did the trout feed on? I spent the whole first day exploring the meadow, and doing some casting first on my own and then helping Julia. We also scouted out locations for filming so we would be ready during golden hours for standard shots and also could scout for potential underwater filming locations. One of countless wild but non-native brook trout we landed on the trip. Very beautiful fish, even when out of place in the Rockies. It didn’t take long to make the biggest discovery. This river was absolutely loaded with brook trout. It was overpopulated, as I had read about in various books. The hatchery description above was not an exaggeration. Even in little backwater pools a few inches deep, we’d often seen ten or more brook trout packed into a small area. The river also had an abundant population of benthic macro invertebrates: aquatic insects that lived on the stream bottom as nymphs and hatched into flying adult insects. Though there were hatches all day—mayflies, midges, caddis flies, and small green stoneflies—the biggest was a mayfly hatch mid-afternoon that left the air thick with small delicate sulfurs. Fish fed all day also. At least the brook trout did. We could cast pretty much anywhere in the river—riffles, pools, deep water, shallow water, under bushes, and in the open—and catch brook trout. The largest were about 10”. Many were 5” or 6”. Some had heads too large for their bodies. Another of the many many (many many) brook trout, caught and released. But by the second day we realized we could have a few non-released invasive brookies without the river noticing. We were doing the cutthroat, and even the other brook trout, a favor. I have practiced catch-and-release fishing for native brook trout in many waters of Maine. 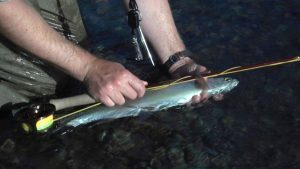 Though there are many healthy populations in my favorite rivers, they experience enough fishing pressure that I would not keep a fish even in many rivers where it is allowed. On this river we had no qualms about keeping a whole creel full of little brook trout and twice having a big meal of the delicious delicate fresh-caught fish—some cooked in oil in pan, some wrapped in aluminum foil and baked over the fire, and some roasted on a stick. 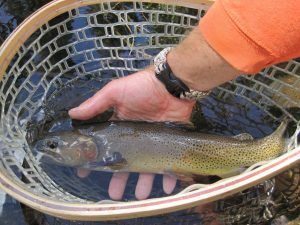 We could have done that ten more times and barely made a dent in the population; indeed, we would have improved the health of the remaining fish, especially the cutthroat. Catching cutthroat was a bit harder. The inhabited only the deeper pools—and often the stiller water—and were warier. They also tended to bite mostly in the early morning or late afternoon. But on the second day we began exploring upstream, and didn’t have to travel too far before we found some deep plunge pools were big fish were stacked up waiting to leap falls and move upstream. In one pool I landed three 15” deep golden cutthroat in one ten-minute stretch when there was a good mayfly hatch—though I actually caught them on a #14 hopper pattern which I tied on after seeing several of the terrestrials hopping around the meadow. Nighttime temperatures were cool, mostly around 40°. One morning we woke with frost on the tent. But the air was dry and the sun was powerful. In the daytime, standing in the sun, I think the air temperature must have approached 80°. In the thin air, I slathered on sunscreen and never went long in the daylight without a wide-brimmed hat. I didn’t bring waders and never needed them. Most of our party fished from shore in hiking boots. I usually wore sandals so I’d have the freedom to wade. By 9:00am every day it was warm enough for wet wading. Two or three afternoons some thundershowers rolled past. But it never rained more than thirty minutes in a day. We had mostly blue skies, and at night the brightest stars imaginable. On the last two days, after everybody had adjusted to the altitude, we hiked about an hour up the hill to fish one of the lakes hoping for some bigger fish. I cast hoppers on Valentine Lake, and continued to land as many brook trout as I wanted. Though we didn’t catch the small ones we had been hooking in the river, the biggest ones in the lake were no bigger than the largest ones in the river. What I really wanted, though, after reading Rich Osthoff’s Fly Fishing the Rocky Mountain Backcountry (a book recommended by David Crowne) was to catch a big cruising fish using the techniques in the book. I finally spotted two big rainbows—by big I mean they looked like 18” to 20” fish when they swam by, and so they were probably 15” to 16” fish. I spooked them before I could cast. So I left the water and went to the top of a ledge and sat and watched, like I’d read in the book. It took an hour of watching 8” to 10” brook trout passing below before I got another chance at the bigger fish. But finally the two rainbows came by again. I had tied on a pink scud—once again the Osthoff recommendation for most of the high lakes. And I made a perfect cast, landing the scud softly about 8’ in front of the foremost fish. It swam over as the scud sank, and sipped it in. Whether my tippet was too light, or I had spent too much time playing fish less than half its weight, or I was too high strung with anticipation and the fact that I had watched the fish, or—just possibly—maybe it really was a 20” fish and really heavy: I set the hook too hard, had the fish on for about one second, and then it snapped my 5x tippet with one strong head shake and swam off with my scud hanging from its lip. And I never saw either fish again. Fortunately, back down the hill at the South Fork of the Little Wind, I managed to get into a couple more big cutthroat. One pool, at the bottom of about a two-foot waterfall, must have had forty fish in it—maybe six or seven cutthroat and the rest brook trout. Most swam deep in the plunge pool hidden by the swirling white water from the falls, and we didn’t see them until I went in with the underwater camera. But there were always ten to fifteen fish just lazing under the ledge in the quiet side water. Again mostly brook trout, but if I snuck up on the lodge I could ambush the big cutthroat and watch them for a while before the disappeared under a big boulder. In the mid-afternoon they would begin their attempts to jump up the falls and colonize new water. I counted them: a fish jumping every fifteen seconds for minutes at a time. Further upstream was an ever deeper pool below an even higher falls. Fish were jumping there, too. Bigger fish, with fewer successful attempts. That was where I landed the biggest fish, and the most fun to catch because of the challenge of getting a fly down to it. On the final morning we had our gear packed up around 8:00am. The wranglers had arrived the evening before and camped just 200 yards downriver. The bear that we never saw in five nights had come wandering around their camp looking for handouts. They’d had to shoo it away. I had mixed feelings. I’m glad it wasn’t a pest for our whole trip. But I wouldn’t have minded seeing it one morning. Especially the last morning after our food was packed and it was too late for it to make me lay awake at night worrying. We packed the horses, said goodbye to the river, and started the long ride back. I took a bunch more photos of scenery and wildflowers. More-or-less the same photos I took on the trip in. But it’s so beautiful that it’s hard to resist. Jessie kept us entertained with stories about wrangling, and trying to help me learn the names of the flowers. I’d pretty much forgotten them all by the next day. Another amazing dinner was waiting for us on our return: delicious of stew with fresh hot bread, and a variety of pies for desert. And hot showers, after six days without. I was once told by a steelhead fisherman that when you catch your first steelhead, you start dreaming about your second. When you catch your second, you start dreaming about buying property on the river. I am now dreaming about my return to the Wind River Range.